Please be sure to read over ALL of the details below!! This is VERY IMPORTANT so you understand exactly how this event works. Wouldn’t it be great if you could find someone who would get the plastic eggs, fill them AND hide them in your yard for Easter morning?? GREAT NEWS…. Holmes County Humane Society is taking orders now!! Order Your Candy-Filled Eggs to be delivered to your yard and ready for Easter morning fun!! 25 Eggs scattered in your yard or a friends yard for $20, 50 Eggs scattered for $45, or 100 Eggs for $65. We will be egging houses the night before Easter, April 20th starting at 8pm. We are limiting our deliveries to addresses within Holmes County ONLY. Please leave a light on outside if possible for deliveries made after dark. Please close curtains to prevent children from seeing those making the deliveries. All proceeds benefit Holmes County Humane Society, Inc.
SPECIAL NOTE CONCERNING PEANUT ALLERGIES: Most of the candy we use is donated, therefore, candy may contain nuts. 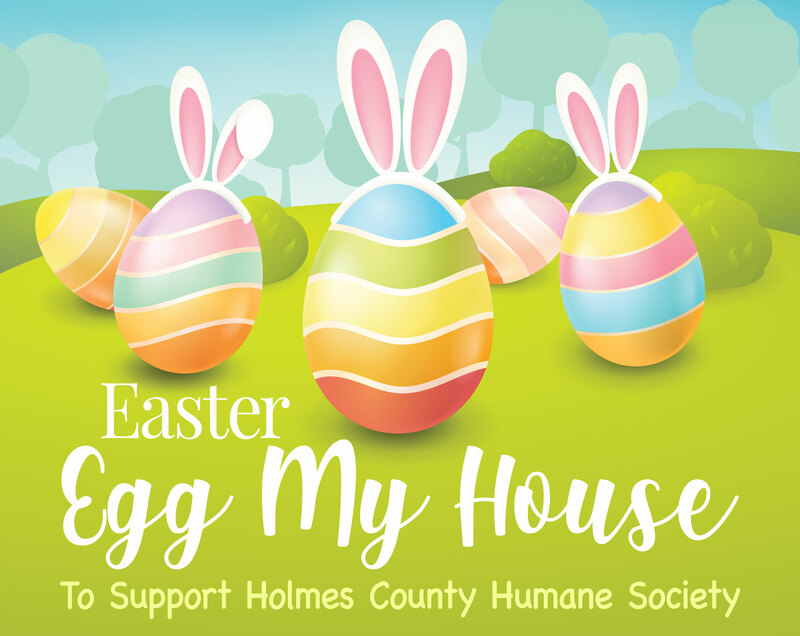 Thank you for supporting Holmes County Humane Society!